The HS2000 is a short recoil-operated, locked breech, striker fired semi-automatic pistol. They use a polymer frame with steel inserts, mounting rail and trigger-mounted safety. A Cocked striker indicator protrudes from the rear of the slide when the striker is cocked. A loaded chamber indicator pivots up on top of the slide when a round is in the chamber being both visual and tactile. An ambidextrous magazine release is also standard. Take down of the pistol is through a lever on the left side of the frame that rotates up, allowing the slide to move forward off the frame. This is very similar to the mechanism of take down as seen in pistols manufactured by SIG Sauer. 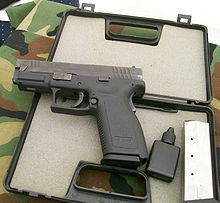 The trigger does not have to be pulled for the pistol to be disassembled, unlike some of its competitors (and even early versions of the XD). The factory-standard trigger has a travel of 13 mm (0.5 in) and is rated at 25 N (5.6 lbf) to 30 N (6.7 lbf). Most HS2000s have dual captive recoil springs; however, the XDM and Tactical 5 in (130 mm) models have non-captive springs. The recoil spring guide rod also acts as a standoff device, as the end of the rod protrudes from under the barrel and keeps the slide in battery when pressed against an object such as someones's chest in contact-distance self-defense situations. This prevents the slide from being moved back because the device pushes the surface area of objects away from the slide, thus increasing the chance that the gun will function normally. After heat treatment the metal parts are finished with a proprietary nitriding process called Tenifer Plus+. This finish is characterized by extreme wear and corrosion resistance; it penetrates the metal, and treated parts have similar properties even below the surface to a certain depth. The Tenifer Plus+ process produces a matte gray-colored, non-glare surface with a 64 Rockwell C hardness rating and a 1,200–1,300 N/mm2 tensile strength. This finish makes the HS2000 particularly suitable for individuals carrying the pistol concealed, as the highly chloride-resistant finish allows the pistol to better endure the effects of perspiration. 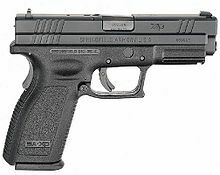 The HS2000 has a grip safety that will not allow the pistol to fire without depressing a lever on the rear of the grip. This feature is present on some older pistols such as the M1911. Unlike the 1911, the grip safety on HS2000 series (except the XD-S line) also locks the slide. The means without a perfect grip on the gun to depress the grip safety, the slide cannot be cycled to load or clear the gun. In addition to a trigger safety, a drop safety prevents the striker from releasing if the gun is dropped or exposed to a significant impact. As of 2008, 4 in and 5 in XD .45 ACP Service models are available with an optional ambidextrous frame-mounted thumb safety. This option is now available in 9mm, .40 and .45 ACP pistols. 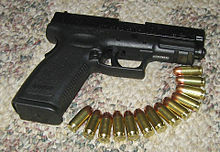 The HS2000, except for the XD-S variant, is fed by staggered-column (otherwise known as "double-stack") detachable box magazines that are made of polished stainless steel with a polymer basepad. The empty weight of a standard-sized HS2000 box magazine is 80 g (2.8 oz). The Springfield Armory XDM .45 ACP is offered in three different models with 3.8, 4.5, and 5.25 inch barrels. Each of these models has a 13 + 1 capacity, while the highest capacity is 19 + 1 for the 9mm model. The 3.8 in (97 mm) model is also available with a compact magazine that holds 9 rounds that reduces grip length by one inch for a more comfortable conceal carry option. Other variations are available from the Springfield Armory Custom Shop and also some European gun stores. 10-round capacity CA compliant magazines are available for all models except the XDM series and XD-S (whose maximum capacity <10 rounds with or without factory extended magazine). Bosnia and Herzegovina: Used by the armed forces. Croatia: Standard sidearm of the Croatian Armed Forces and Croatian Police since 1999. Dominican Republic: Used by the armed forces. France: Used by the RATP. Georgia: Standard Issue pistol of Georgian Police, also used by some Army Units. Indonesia: Used by the armed forces. Iraq: Used by the Iraqi police. : Used by the armed forces. Malaysia: Used by the armed forces. Thailand: Used by the armed forces. United Kingdom: Trials use only, not adopted. United States: Issued or approved for use by a large number of police departments and other law enforcement agencies, including the Chicago Police Department. ^ "Frequently Asked Questions". HS Arms. 2007-05-20. Archived from the original on 2009-12-14. Retrieved 2007-11-22. ^ Fortier, David M. (December 2000). "A New Polymer-Frame Service Pistol From Croatia". S.W.A.T. ^ "2006 Golden Bullseye Winners". National Rifle Association. May 2006. Retrieved 2008-10-15. ^ NRA Staff. "Springfield Armory XDM: 2009 Handgun of the Year". Retrieved 24 November 2014. ^ "Springfield Armory - Handguns, Pistols, Semi Automatic Rifles". Springfield Armory. Retrieved 24 November 2014. ^ Elwood Shelton. "Springfield Armory Introduces XD Mod.2". GunDigest. Retrieved 20 November 2014. ^ "Modern Firearms HS2000 page". Retrieved 24 November 2014. ^ "XD-S Magazines .45 ACP". ^ a b c d e f "HS Produkt" (PDF). Hrvatski vojnik (in Croatian) (337/338): 20. 28 March 2011. Archived from the original (PDF) on 7 October 2012. Retrieved 2013-05-11. Wikimedia Commons has media related to HS2000/Springfield XD. This page was last edited on 30 January 2019, at 15:30 (UTC).